Let’s get the obvious reason you overeat out of the way: Food tastes really good. And some of it tastes really, really good. The truth, though, is that everyone likes food, yet some people struggle to find their stopping point more than others. We asked Men’s Health Nutrition Adviser Michael Roussell, PhD, to help you understand why. “Being aware of the reasons you might overeat can help you identify the behaviors that are holding you back from the results you want,” says Roussell. Use his advice so that you can fill up—without filling out. Ever had a hard day at work and say, “I deserve a glass of wine”—and then proceed to drink the whole bottle? And have you ever done that more than once in a week? “You need to be realistic about the caloric cost of using food as a frequent reward,” says Roussell. Start noting all the places that you allow high-calorie meals or binge-drinking to creep in because you “deserve it.” If it’s once a day, or even once every two or three days, you’ve identified a key area where you need to adjust your mindset. Try to keep a logical perspective: Having an extra piece or two of pizza isn’t a big deal in the grand scheme of your diet. There’s room for error, especially if you plan for it. For example, in one study, University of Toronto researchers rigged scales to make dieters think they had gained 5 pounds even though the participants had actually lost weight. Those who felt greater shame about their weight gain subsequently ate more ice cream than those who weren't as bothered by their results. Wake Forest University scientists observed similar findings. According to the USDA, more than 40 percent of meals are eaten away from home. “The loss of control over portion sizes often leads to overeating,” says Roussell. If you’re going to a more upscale establishment, simply plan ahead strategically so that you can allocate more calories for the meal—guilt-free. “Multitasking lessens your body’s ability to sense the amount of food you are eating and thus how full it should make you,” says Roussell. Roussell’s advice: Engage in eating as its own activity, and be mindful of what you’re putting in your mouth. British researchers discovered that those who could recall exactly what they ate for lunch downed 30 percent less than those who couldn’t. 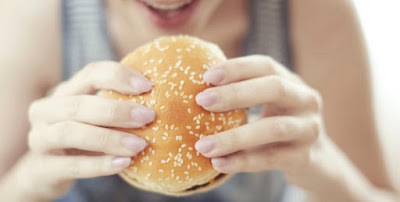 The scientists say that remembering recent eating might enhance awareness of how satiating the food was, which then has an effect on subsequent consumption. And for best results, try to keep a consistent sleep schedule, so that you aren’t as inclined to oversleep on the weekends. A recent Australian study found that people who sleep later than normal on Saturday and Sunday have greater levels of fatigue on Monday and Tuesday than those who rise at their regular time.